Access archived video footage of more than 30 presenters and thousands of sustainable business professionals from the 3-day GreenBiz Virtual livestream. Gain actionable insights on critical trends across seven tracks: Design & the Circular Economy, Financing Sustainability, Materiality & Metrics, Purpose & People, Responsible Supply Chains, Stakeholders & Storytelling and The New Energy Landscape. Register for full access to the archived video available to you on-demand. Includes access to recorded archive. Thank You — Information on how to access the Virtual Event is on it's way to your inbox. GreenBiz Chairman and Executive Editor Joel Makower, CEO Eric Faurot, and Conference Director Ellie Buechner welcome GreenBiz 18 participants to the conference. The eleventh annual State of Green Business report examines the key trends affecting sustainable business, provides an assessment of the key metrics of company performance on natural capital and other resource issues, and offers a look into the state of the sustainability profession. Hear from renowned designer and Cradle-to-Cradle co-founder William McDonough and Fashion for Good Executive Director Katrin Ley on the opportunities for reshaping the fashion industry into a force for positive change. CEO Action for Diversity & Inclusion™ is the largest CEO-driven business commitment to advance diversity and inclusion in the workplace. Hear from leaders driving this movement on the need for collaboration, progress so far, and vision for the future. Hear from the GreenBiz 18 Emerging Leaders about their vision for the future of sustainable business. The GreenBiz Emerging Leaders Scholarship sponsored by PwC empowers the next generation of sustainable business leaders and welcomes young individuals from diverse backgrounds to the sustainable business field. Recipients are hand-selected from a competitive applicant pool to attend GreenBiz 18 — all expenses paid. Project Drawdown is the most comprehensive plan ever proposed to reverse global warming and reach the point in time when the concentration of greenhouse gases in the atmosphere begins to decline on a year-to-year basis. Hear from Project Drawdown on how its team of PhDs developed the plan, based on existing solutions and technologies, and how businesses can act on these opportunities now to put carbon back where it belongs. GreenBiz President Pete May kicks off the second day of GreenBiz 18. The future of corporate sustainability leadership involves finding ways to engage the public to think and act sustainably. This is a task that companies can’t do alone and is best achieved by creating partnerships with NGOs and others to connect with the public and spread the word about companies that are trying to make a difference. As one of the world’s largest restaurant companies, McDonald’s has the responsibility and opportunity use our Scale for Good. Together with Franchisees, the company’s supply chain, NGOs and other partners, McDonald’s is working to a meaningful impact to areas that are important to customers and the company to build a sustainable business and future for our planet. McDonald’s and Environmental Defense Fund have worked together for over 25 years, with a ground-breaking partnership helping McDonald’s to improve packaging and reduce waste, an area extremely important to McDonald’s customers. This panel will explore important opportunities for cross-sector partnerships, how corporate leaders can raise the bar on sustainability, how customer demand influences and accelerates change in business, and the importance of educating and engaging customers as part of the solution, such as by increasing recycling behavior and options in restaurants and communities. As demand for bottled water continues to grow, water sources need to be carefully identified, developed, and managed to ensure their sustainability. At the same time, growing community and environmental concern has made siting new sources increasingly challenging. To address this, NWNA has developed a first-of-its-kind Siting Framework — a collaborative process to encourage clear, consistent outcomes along with transparent engagement with communities as potential new water sources are identified, evaluated, designed, and brought online. According to the International Finance Corporation, the historic global agreement on climate change adopted in Paris helped open up nearly $23 trillion in opportunities for climate-smart investments in emerging markets between now and 2030. Who will provide that funding? What is the role of conventional banks, institutional investors and governments? Understanding the dynamic energy finance landscape will be key to unlocking the opportunities. Hear from Steelcase Director of Design Bruce Smith about how to push limits, explore edges, and prototype quickly, and the benefits of applying design thinking to developing sustainable systems. Hear how International Paper and Procter & Gamble are driving sustainable change throughout the value chain and beyond – through strategic alignment, cross-functional dialogue and partnerships. Sustainability leaders will discuss their companies' respective citizenship strategies, as well as specific collaborations that leverage their combined expertise and scale to create value for customers and stakeholders across commercial, technical, supply chain and sustainability areas. How does public policy determine clean economy business outcomes? Why is it imperative for business leaders to leverage their market power to truly accelerate clean energy, climate and sustainability innovations at the policymaking level — especially under this challenging federal administration? ASU, with the help of some special guests, previews the Sustainability Solutions Celebration, presented as part of the Sustainability Solutions Festival hosted by the Julie Ann Wrigley Global Institute of Sustainability. In today’s political environment, the mantle of climate leadership has been passed to the private sector. Supply chains are the new frontier of sustainability and accelerating this transformation can’t wait. Today, nearly half of all American Fortune 500 companies have stepped up to set climate targets, generating huge results for the planet and the bottom line – more than $3.7 billion in savings for corporations last year alone. No single company can drive change at the scale we need, but together we can identify and implement climate solutions that fight planetary warming, cut waste and protect nature. Hear from WWF’s Sheila Bonini, senior vice president of Private Sector Engagement and Laura Phillips, senior vice president for Global Sustainability at Walmart, on the promise and challenges of Project Gigaton, the level of commitment and progress to date, and the steps needed from both the private sector and NGO partners to ensure success leading up to the 2030 goal. GreenBiz Group Director of Strategic Programs Shana Rappaport opens our Wednesday afternoon program. Hear from National Geographic photographer and marine biologist Cristina Mittermeier on the intersection of nature and culture for coastal indigenous communities. The United Nations Global Compact is the world’s largest corporate sustainability initiative, with more than 13,500 signatories from 170 countries committed to aligning strategies and operations with universal principles on human rights, labour, environment and anti-corruption, and taking actions that advance societal goals. Hear from CEO and Executive Director Lise Kingo on what it takes to mobilize action at a global scale. GreenBiz Group CEO Eric Faurot kicks off Day 3 of GreenBiz 18. Can you envision a commute with zero crashes, zero emissions and zero congestion? GM is steering into this future, viewing both its energy use and product portfolio in a holistic way to enable cleaner cars driving on a cleaner grid. From RE100 progress to strengthening EV infrastructure and committing to launch 20 all-electric vehicles globally by 2023, the company is activating each component in a strategy to transform transportation. As corporate sustainability target-setting becomes increasingly integrated into core business decisions, agreeing to and implementing ambitious targets now reaches far beyond sustainability teams. With over 320 companies seeking Science-based GHG targets, and leading businesses pursuing context-based targets for impacts related to land and water use, the momentum toward targets that actually solve key sustainability issues is palpable. 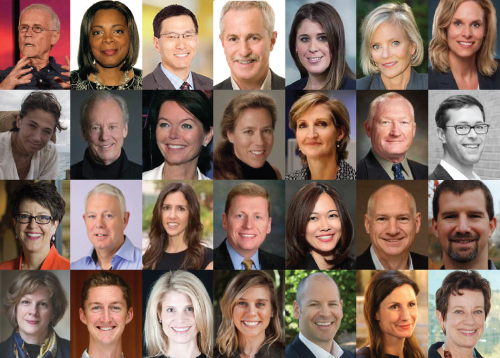 Hear from business executives on how and why they set their sights on next-generation targets—and the challenges and opportunities they face. More than half of S&P 500 companies exceed board-level oversight requirements on environmental or social issues, especially in industries subject to scrutiny. More directors and executives see the financial risks and opportunities of sustainability. How do boards oversee a company’s sustainability efforts? What role can sustainability executives play? Shelton Group has been polling Americans for over a decade to understand their beliefs, desires, and espoused behaviors related to energy and the environment. For most of that time, the numbers have been largely consistent in terms of the percent of Americans whose beliefs and actions align on sustainability – and it was a pretty niche group (about 18-22%). Three years ago something began to shift. It seemed like an anomaly in the data. But then the numbers shifted further upward the next year. And the next. Now, the data shows that Americans are working through a massive shift on sustainability, much like the shift in attitudes towards littering and smoking. It is no longer socially acceptable to be seen as a person who lives life with no regard for the environment and/or the health and well being of the world at large. And that means it’s no longer socially acceptable to buy products that harm the environment – or buy from brands that are seen as “villains” of the environment. Hear key trends and real world examples of organizations gaining real traction by telling their sustainability stories.